If hearing loss is the invisible disability, then sound is the invisible hazard. Without even being aware of it, the sounds we subject ourselves to might be creating permanent hearing loss that grows irreversibly over the years. A typical conversation registers at a volume of roughly 60 decibels. City traffic registers at approximately 80, a rock concert at 100, a sporting event at 105, a power saw at 110, and a shotgun blast at a deafening 145. Here’s the issue: repetitive exposure to any sound above 85 decibels can induce irreversible hearing loss. That’s the reason why hearing protection is specifically critical for musicians, concert-goers, hunters, and construction workers. But it’s not as easy as just staying clear of the sound. Most of us are unwilling to abandon our jobs or forgo attending concerts just to ensure that we can hear better when we get older. The only solution is a compromise: protecting our hearing by limiting the volume of the sounds we’re exposed to. Welcome to the world of earplugs. Sound is dynamic—specific frequencies call for different handling, and volume shouldn’t be decreased by too much or by too little. So, for an earplug to be effective, it has to 1) reduce the volume of sound, but not by too much or too little, and 2) deal with assorted types of sounds, or frequencies, differently. As you’ll see, custom earplugs achieve these two feats much better than foam earplugs and have the advantage in three vital categories: sound quality, comfort, and cost. Disposable foam earplugs block out all sound and all frequencies, creating what is called the occlusion effect for the user, which is the sense of a “hollow” or “booming” echo-like sound in their own voice. 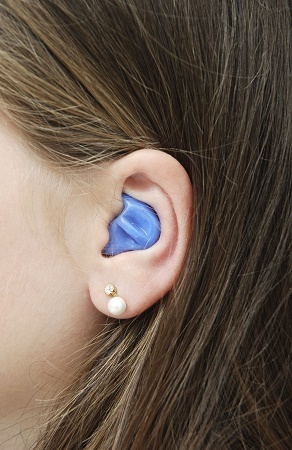 Foam earplugs reduce overall sound quality and produce a confined sensation. Custom-molded earplugs, on the other hand, come with advanced filters for a precise, even level of noise reduction (attenuation). The earplugs can be programmed to decrease volume only by the necessary amount, and can filter specific types of sound more than others, preserving the quality of speech and music. Foam earplugs, to be effective at reducing volume, have to form a deep seal within the ear canal, creating a sustained feeling of pressure, and this “plugged up” perception is nearly universal. Custom earplugs, however, are molded to the curves of each patient’s ears by a hearing professional, producing a secure, natural fit without the feeling of constant pressure. Custom earplugs are also developed with soft, medical-grade material that doesn’t shrink or change shape. In addition, foam earplugs are unable to adjust well to variations in ear size and shape. Since custom earplugs are specifically shaped for each patient, variations in ear size and shape pose no problem at all. Let’s do a comparison of that $197 to the cost of a pair of custom earplugs. A top quality pair of custom earplugs can last four years or longer, but let’s just say four. The majority of custom earplugs cost under $100, so your total cost after four years is less than half the cost of the disposable earplugs—and you get better sound quality and comfort in return. Not to mention that by wearing the same custom earplugs for four years, you’ll reduce the waste associated with throwing out over 1,000 pairs of foam earplugs. Custom molded earplugs and foam earplugs will both decrease volume and protect your hearing, but that’s where the commonalities end. Custom earplugs have better sound quality, are more comfortable, and cost you and the environment, in the long term, significantly less.